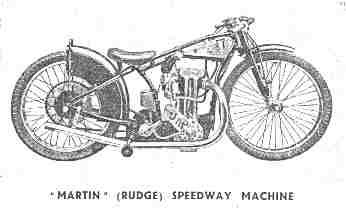 The popularity of the "Rudge" frame with the J.A.P speedway engine unit is well known. Martin make the Frame under special licence from Rudge Whitworth Ltd and has been proved to be the best and easiest handling machine on the dirt. The J.A.P combination speedway engine proved to be the finest engine for the work. Speed, Power and most of all, reliability. Engine.- 80 mm. bore by 99 stroke. The induction port is of the Down-Draught type and is inclined 12.5 degrees. Sundry other details have been improved to make the unit still more efficient and reliable. Lubrication.- Force feed to the Big End with separate Oil Feed to the Rocker Box and Valve Guides via a double delivery Racing Pilgrim Pump. Carburettor.- AMAL Special J.A.P. Dirt Track with quick opening Twist Grip. Magneto.- B.T.H. Special Racing type, fitted which Platinum points and waterproof end cover. Frame.- PROVED BY EXPERIENCE to be the most suitable for all tracks and easiest to control. Forks.- Special Webb Dirt Track Forks. Footrest.- Adjustable on offside only. Kneehook.- Adjustable with rubber covering. Handlebars.- Chromium Centre and Celluloid covered on bends. Cinderguards - Short, front and rear, also guard on front down tube keeping flying cinders from the rider and the Cylinder Head. Fuel Tank.- Finished in chromium and suitable for the special fuel used. Oil Tank.- Located behind seat tube. Capacity, 1 pint. Exhaust Pipe.- Large diameter single pipe to offside of machine and Chromium plated. Transmission - By roller chain 1/2 x .305 engine to Gear box. 5/8 x 3/8 to rear wheel. Clutch.- New special heavy duty multiple plate, designed specially to withstand the strain of the Clutch starts. Gear Box.- Single speed, the only moving part being the roller bearing mainshaft, the standard gear ratio is 8.83 this can be varied by changing sprockets, see details in instructions. Wheels.- Front is fitted with either FIRESTONE or AVON, 28x2.375. Rear is fitted with AVON SPECIAL 28x.2.75. Rims are chromium finish. Stand.- Central Spring up type. Lifting Handle.- On rear Guard. Finish - Frame and forks, Black Enamel. Tank, Rims, Handlebars and Exhaust Pipe, Chromium plated. Price Complete £87 (Eighty Seven Pounds). De Luxe Model £92. which includes specially prepared Cylinder Head, Valanced rear Mudguard, special B.T.H. Magneto and 28x2.75 AVON Dirt Track tyre.